United Backpackers hostel is located in Tallinn city centre, right by the Freedom Square (Vabaduse väljak) and on the verge of famous Tallinn medieval Old Town. Our address is Kaarli puiestee 11 (Kaarli Road 11), easily accessible both by car, bus, as well as by foot. What makes our location truly great, is the fact that all of what Tallinn has to offer is within a five to fifteen minute walk, be it sightseeing, night life, shopping, or ferry port and central railway station. United Backpackers has a 24/7 reception and a friendly, helpful international staff at your service. 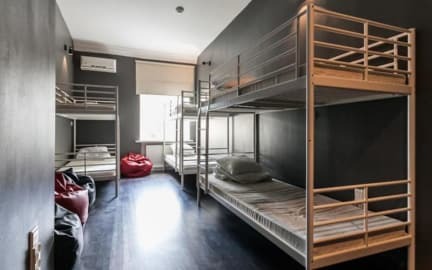 In the three floors of our hostel, there is a common area aka The Bunker in the basement - complete with a pool table, TV room and a fully equipped kitchen; ground floor features reception and chill out room; dorms, privates, showers and restrooms are located on the second floor. Free wireless internet in all rooms and common areas. Room types vary from privates to cool bunk bed dorms, privates accommodate 2, and dorms 4, 6, 8 or 12 persons. Besides accommodation and great company, here's just a few things we're offering during your stay Tallinn: pub crawl, walking tour in Old Town, Kalamaja hipster neighborhood tour, Seaplane Harbour, Tallinn TV Tower, Red City Bus tour. Should you have any special wishes for events or activities, just let us know and we'll work it out! * 'The Bunker' - common area in what used to be a bomb shelter, how 'bout that?! * Full size pool table available to guests for free! * We sell beer (and other drinks for that matter)! * Best Walking and other tours available for booking at our reception! Great experience at this hostel. A staff member gave us an amazing dinner recommendation which anyone who is reading this should check out! Kompressor for dinner. Cheap and unbelievably delicious pancakes!!! Not your average pancake - I promise you won’t regret it. Great location, friendly people, and great spot to stay while in Tallinn. Great common area and nice location just outside the old town. Did have to wait for the WC briefly once or twice. I really enjoyed my stay at United Backpackers. The facilities were really good, staff were friendly and it had super cosy, friendly vibes! Overall a very good hostel, located quite close to the old town. The staff is very nice and helpful and actually know the city really well, too. The bathrooms are spacious and get cleaned regularly. They have lockers, but there are not enough lockers for people in a room, that´´ is why some lockers are outside of the room. Facilities are ok, sometimes the rooms unfortunately seem a bit run-down and musty. However, for a weekend trip I would stay there again. Cool place with lots of hangout areas. A little on the older side, but it's clean and has a good vibe to it. Good place to stay in Tallinn. A nice little hostel, which was better than I expected. The room was quite nice and large enough for the amount of people (6). The only issues were that majority of the fixed lights didn’t work and there wasn’t a central fixed light so it got quite dark, which is not handy if you need to walk around. Other than that, it was a great little stay, with a perfect location only a short walk to the old town. really nice hostel :) good location, 5min walk to the old town. ferry port and train station around 20mins. room size was good for a 6 bed dorm, little lockers outside the rooms as well. very laid back atmosphere, not a party hostel so dont expect that! theres only 2 toilets on dorm floor though, really not enough! Great, quick-getaway, hostel. Most staff are helpful and polite. Snooker table and TV. Easy distance from all of the main attractions.